Disclaimer: I received this product at a discount for review purposes. If you've ever been in the gym or running out and tried to listen to music, send a quick text or check your favourite fitness app, you know its almost impossible to use your phone while it's covered with a thick plastic and tied with a stiff arm band. 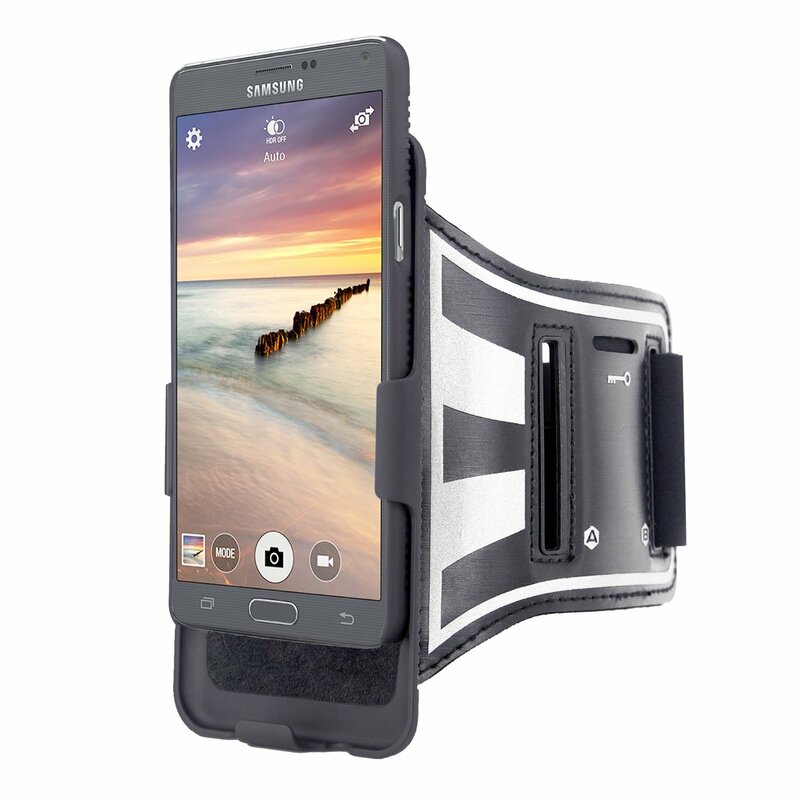 Now with our new and revolutionary armband holster you can easily interact with your touch screen and listen to your favourite music thanks to the creative 90° rotating system that gives you full access over the screen. The Fittense Sports armband combo is a nifty accessory for anyone who goes to the gym, biking, or jogging on a regular basis. It makes it easier to carry and access your phone with ease. When buying this armband be sure to double check which phone you are buying for. The list of phone choices is listed directly below the price. So it's easy to see why some people may order the wrong phone case. It's Sweat Proof, has a reflective strap and has a secure key holder so you never worry about having to carry your keys in your pocket or losing them at the gym. Workout case for Galaxy Note 4 with convenient open face design and creative 90° rotating holder that gives you full access over the phone while exercise! Ideal for those who follow fitness apps, to listen music or send message while doing sports. Very convenient openings for volume controls, lock button, speakers, camera and jack entry which is useful. I chose the Note 4 case and what I found to be great about it is that the Note 4 version of the case can also handle the Note 3. So if you were worried about it fitting an older model you don't really have to worry much. I liked the ease of use and the fact that it has a removable case that you can use separately for your phone to carry around for just personal use. What I didn't like was the length of the arm strap. I thought it could be a bit longer especially for those with more muscle mass. But all in all it works well. I have held my phone in it and shaken it to hell and it never once dropped my phone. It's great if you also want to do some live streaming of a certain workout or when you are just out for a walk or bike ride in your area. Since you can adjust the screen orientation it's on the fly it really is a versatile product. Overall I give it 3 1/2 stars. The armband length may give some people trouble depending on how big or small your arms may be.